Everything was perfect from the first meeting until the last song at the reception! The food was delicious! The service was top notch too. We highly recommend the Great Room at the Top of the Hill! I cannot say enough about how happy we were with The Great Room as our venue for both our ceremony and reception. We looked at basically all the urban indoor venues in the Triangle, and they were *by far* the most accommodating and affordable. As an all-inclusive venue (including a personal wedding coordinator! ), you not only get the most bang for your buck, but they also take so much stress out of planning a wedding. The space is beautiful and functional. The food and drinks were amazing -- so many of our guests told us so. We didn't have to lift a finger on the day of. We dropped off all our various decor items (table runners, photos, etc), and the staff set them up beautifully. Our coordinator, Molly, was the jam. She was so responsive and helpful leading up to the event -- meeting with us, answering all our questions, giving suggestions and recommendations. And on the day of, she ran everything like a boss. The entire day went smoothly, thanks to her prep and management, and the amazing staff. Lauren and her team at the Great Room literally took care of everything from verifying the vendors prior to the day-of to running the show during our wedding day. I'm sure there were many details behind the scenes I had no idea about, and I'm so glad for it. The venue itself is highly customizable, though we went pretty minimal. We received so many compliments afterwards about the amazing food. Honestly, cannot say enough about our fantastic experience with the Great Room. Lauren and her entire team made our Bat Mitzvah party incredible. The responsiveness, quality of service, the space and the food made the night incredible. I highly recommend the Great Room for any special event. You will not be disappointed!! Amazing! Lauren was wonderful with the coordination of all the details of our intimate wedding. The ceremony was beautiful, guests loved the games at cocktail hour, and the food at the reception was soooo good! If we ever need to host another private event, we’re checking here first. I don’t think we could have asked for a smoother, more perfect day. Plus there wasn’t a lot we had to do on our end: we were able to customize the menu, serve the wonderful beers/wines produced there at the venue, and bring in the vendors we wanted. Absolutely perfect! We had our wedding (ceremony, cocktail hour and reception) at Top of the Hill and I highly recommend it! Danielle and Molly did an awesome job coordinating everything and they were very responsive and professional throughout the whole process (via email, phone and in-person meetings). The food, drinks and service were all amazing and we didn't have to worry about setting anything up before or cleaning up after the reception. Very happy with how everything turned out! We had our rehearsal dinner at The Great Room at Top of the Hill after seriously considering it for our reception venue. First of all, Danielle is amazing! She is very quick to respond to emails and always willing to go the extra step! After we had booked the room for our rehearsal dinner, I emailed her on a weekend that my parents were in town to see if we could stop by and test the computer hook-up for the photo slideshow. Danielle responded in less than 24 hours and met with us the day she responded! She also helped us figure out a menu that worked for everyone in our party. Our guests loved the food at the rehearsal dinner, and we loved having our event in such an iconic place in Chapel Hill. Plus, our guests loved being within walking distance of the Carolina Inn (where most of them were staying) and of downtown Chapel Hill. The AV set up worked wonderfully for our photo slideshow - even my dad, who is a photo enthusiastic, was impressed with the quality of the images produced by the projector! The use of the Pandora stations is also very convenient for events like rehearsal dinners. We recently had our wedding (ceremony, cocktail hour, and reception) at Top of the Hill - Great Room and would highly recommend this venue to everyone. Danielle and the staff worked very close with us to make the event better than we had ever hoped. The space was plenty of room for our 120 people wedding. The on site - kitchen and chef was amazing. The chef personally greeted us and made sure we were feed. Everyone at our wedding continues to compliment how delicious our food was. We loved the fact that we had local craft TOPO beer for our wedding! The venue was extremely accommodating with our plans, timeline, and of course the last minute changes. The photographs from the venue look amazing. We loved having our pictures taken in the tank room. Danielle was so wonderful! She took the time to really know us and then help create a wedding that reflected us. We can not thank Top of the Hill and especially Danielle enough for helping make our wedding beyond perfect! Highly recommend them for all events! The perfect venue for the perfect price. Danielle is amazing and made our weekend perfect! We had our rehearsal dinner at TOPO for about 100 people. We dropped off our decorations a few days before and they decorated the Great Room absolutely beautifully! I was so impressed with the way the room turned out. The food was great and our out of town guests really enjoyed the southern food. They were flexible with a few changes that we wanted to make and the dinner was perfect! I would definitely recommend the Great Room for your rehearsal dinner or wedding reception! Top of the Hill - The Great Room was a fantastic find. The staff there was excellent and they made my wedding day stress free. Our wedding day was the same day as the UNC-Duke game (in Chapel Hill) . . . . . so given the craziness of Chapel Hill on that day, to have a stress free wedding was nothing short of a miracle. I HIGHLY recommend this venue. It is a great price for what you get and everyone told me that my wedding was amazing. Wow, how I love The Great Room. As two UNC grads living in Chicago, we knew we wanted to get married in Chapel Hill. As soon as I found out about The Great Room, I was sold. Perfect environment, location, size, and VERY reasonably priced. From beginning to end, Danielle served as the perfecting organizer and day-of coordinator. She handled every detail professionally and made sure we didn't have any unanswered questions and got everything we wanted out of the day. The day went really perfectly and we definitely have Danielle and The Great Room staff to thank for it all. We had lots of handmade decorations that the staff willingly set up for us. They handled all of our incoming vendors, including a five-piece band, took care of flipping the space between the ceremony and reception, did all the audio, the list goes on! 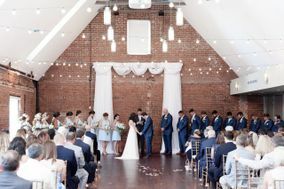 The space is quintessential Chapel Hill, right on Franklin Street, and is perfect for an intimate, smaller wedding. We ended up with around 70 people, which I think worked really well with the space. The space is beautiful, but allows you to be really creative with the decor. It's great, too, that all the food and drinks are included, so you don't have to worry about bringing in a separate caterer. I knew the food would be great, and it was! Our guests also loved the beer. The waitstaff did a great job as well. Couldn't ask for a better venue and staff. I'd highly recommend it! The event coordinator Danielle was wonderful to work with and was very organized and prompt! Our wedding ceremony was in the Great Room. They are great to work with and very helpful. It was a beautiful space and so convenient since our reception was at the Carolina Inn. Our wedding/reception was perfect!! Thanks to Hallie and her team for everything! The food, the organization, EVERYTHING was spot on!! We worked with Danielle to coordinate our wedding reception at Top of the Hill's Great Room and were thrilled with all aspects. She was very attentive to our details and put everything together for us on the day of the wedding. She was very happy to work with our budget and to make many little adjustments to the menu and drinks. We would absolutely recommend this location to anyone looking for an urban venue in downtown Chapel Hill for a reasonable price. Our wedding ceremony and reception were both held in the Great Room. It was a beautiful setup and the internal wedding coordinators do a fantastic job. Molly did a great job making sure everything went smoothly on our big day so that we could enjoy ourselves. I love the hardwood floors, exposed brick and big windows. Overall, we were very satisfied with the venue and would highly recommend to others. We absolutely loved having our reception at The Great Room. The staff was wonderful, met every need, and was able to provide all the unique touches that made the space ours.